We decided to create a perennial garden. Growing and maintaining grass is constant warfare: so we decided to do away with it. We chose to plant perennials, trees, and shrubs that would thrive with only a little of bit of care through the growing season. Each year, we plant annuals most of which are herbs and vegetables. We specifically choose plants that don’t require a lot of watering and that flower at different times through the growing season giving us an ever-changing visual pleasure. The garden, as it is today has reached a level of maturity where it fills in rather nicely by June. We started out small, with clusters of plants and a lot of wood chip. The wood chip worked well as it kept the weeds at bay and over time it composted into a nutritious soil. We are at a point now where we are dividing plants to keep them healthy. 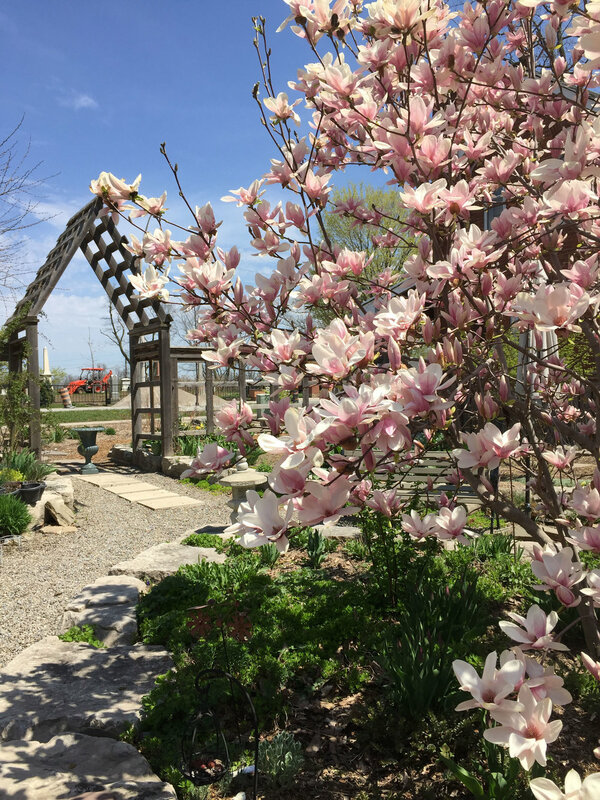 Our garden includes dogwood, purple leaf sand cherry, burning bush, hydrangeas, peonies, iris, lilies, milkweed, sedums, alliums, hostas, and an assortment of vegetables and herbs just to name a few. We have a mix of sun loving to part shade plants and we plant them accordingly. Some of the advantages to a garden yard over grass are: no dried out grass in the summer heat, no mowing, no dandelions, visual appeal, and it is bird, bee, and butterfly friendly. 1. We created a couple of flower beds with a variety of perennials in our front yard, some raised beds in the back yard for vegetables & herbs, and a raised island bed for a magnolia tree & other ornamentals. In addition to the raised beds with have a flagstone sitting area, an interlock dining area, and pea gravel pathways. 2. For the rest of the front yard we put down a thick layer of wood chip directly over the grass and dirt that was there. 3. The next year we added a couple of shrubs and divided the perennials and added another flowerbed area. We also added some rocks and a bench for some hardscaping interest. 4. In the third year we added clusters of plants directly into the composting wood chip. In the open space around the plants, we added cedar mulch. 5. Each year since, we divide plants and may add some new plants for interest. 6. As the garden matures we maintain the plants, add compost to the beds, and enjoy the view of our yard.